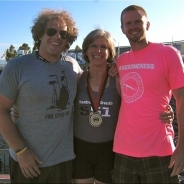 Masters champions are crowned at the 2012 Reebok CrossFit Games. Proving that age is nothing but a number, the Masters athletes took to the stadium on Sunday to showcase levels of fitness unimaginable for many people in their 20s. The Masters started off the day in the stadium with a two-part challenge. 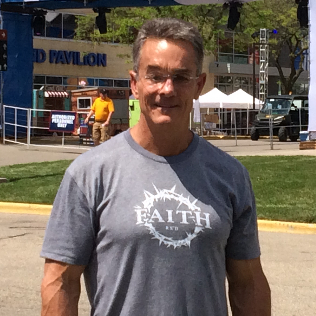 First, competitors ages 55 and older had 2 minutes to complete as many chest-to-bar pull-ups as possible. Athletes 54 and younger took to the rings to complete as many muscle-ups as possible in 2 minutes. 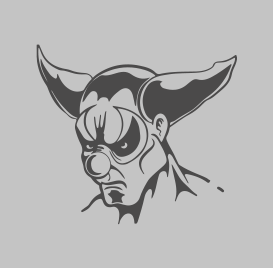 If an athlete could not complete any more muscle-ups or pull-ups but had time remaining, he or she could perform as many empty-barbell snatches as possible to earn partial reps.
and a 40-foot dogsled push. Before today, when chest-to-bar pull-ups came up in a workout, 62-year-old Betsy Finley always scaled to regular chin-over-bar kipping pull-ups. Today, she got 15 chest-to-bar pull-ups. "It was brand new to me,” Finley said. 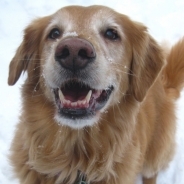 Finley won her division last year, but this year she said she was not counting on anything. “I’m so not counting the chickens,” she said. In the end, Finley was unseated by Mary Schwing, who placed first in the wall-ball dogsled event to become the winner in the women’s 60+ Division. Marnel King took first overall in the 55-59 Division. She busted out 26 pull-ups in the first event of the day and finished the second workout in 4:38.4, finishing first in both. King placed in the top five in every workout of the Games and won three of the seven events. For the final event, her strategy was to go unbroken in the first round of wall-ball shots, "Then I just kind of died a little bit,” she said. As King walked back to the athlete village, fellow Masters athlete Darlene Price hugged her. 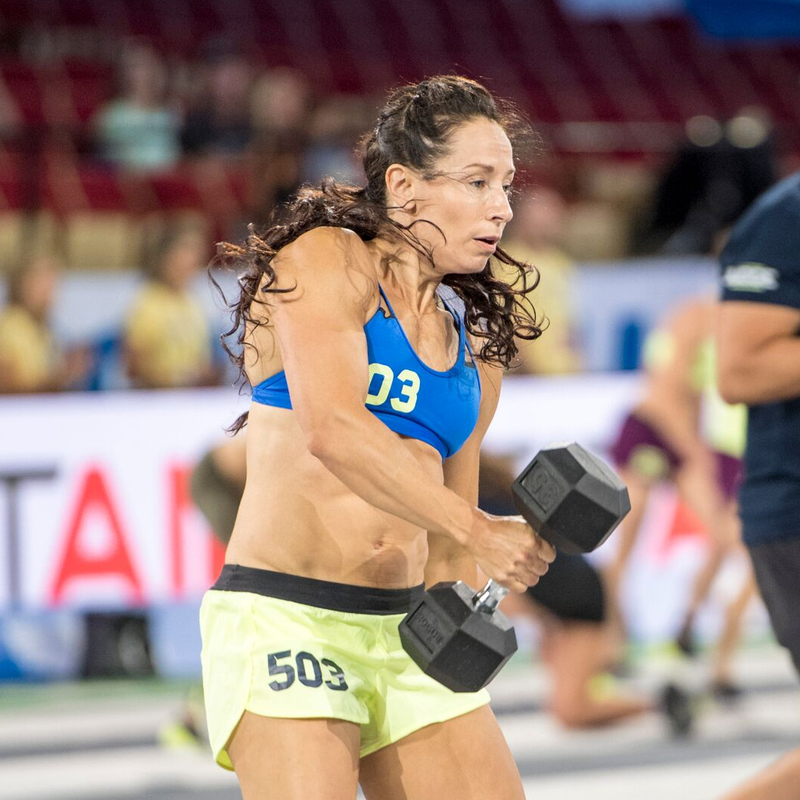 Susan Habbe held onto her lead in the 50-54 Division by doing 8 muscle-ups in 2 minutes, twice as many as second-place Mary Beth Litsheim. Habbe finished first overall by dominating the entire weekend despite undergoing shoulder surgery earlier in the year. 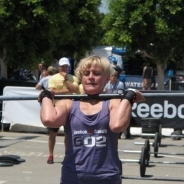 In the 45-49 Division, Amy Mandelbaum only got 2 muscle-ups in the first event. “It was frustrating. 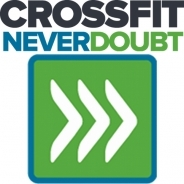 I have muscle-ups,” Mandelbaum said. Her training has been “so heavy” that she felt over-prepared. "Moments like this are frustrating," Mandelbaum said. 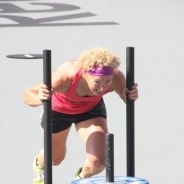 The clear winner in the women’s 45-49 Division was Lisa Mikkelsen, who completed 12 muscle-ups in 2 minutes and finished the second event in 3:13. 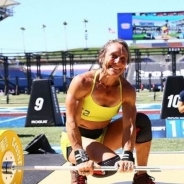 This won’t be 46-year-old Mikkelsen’s first time on the winner’s podium—she was on CrossFit New England’s Affiliate Cup winning team in 2011. 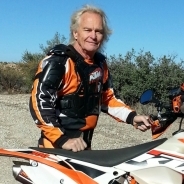 Despite laying claim to the best hair in the Games for a second year running, Greg Walker was unable to repeat his winning performance in the 60+ Division. 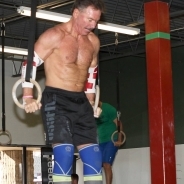 In his third trip to the Games, 60-year-old Scott Olson got 25 chest-to-bar pull-ups in the first event. At 6’1”, 205 lb., Olson said he wasn’t looking forward to the muscle-ups. He took charge in the second event, finishing almost a minute ahead of the second-place finisher, a performance that earned Olson a first-place spot overall in his division. The winner of the 55-59 Division, Tim Anderson, only had one first-place finish all weekend, but his consistent performance was good enough for first place in his age group, which was hotly contested. Anderson tied in points with Rick Rodriguez but earned the win with more higher placing across the 7 events. Incredibly, Garry Jones was only a single point behind. 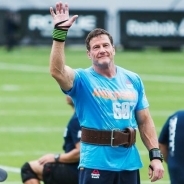 In the 50-54 Division, Brian Edwards performed well in the first event with 17 muscle-ups in 2 minutes, but it was not enough to unseat Gord Mackinnon from first place overall. Mackinnon, a former international rugby star from Canada, won 5 of 7 events on his way to defending his crown from 2011. 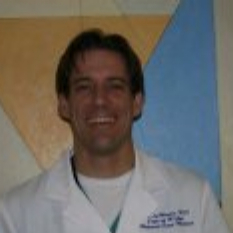 Jerry Hill, age 45, was all smiles after the first workout. "I loved it: 2 minutes of my favorite movements." He described it as a workout where you "just gotta go" and said he tried to get in a good set before he experienced muscle failure. He also said it was nice to be in the stadium on the last day of competition. However, it was Gene LaMonica who came out on top in the 45-49 Division, locking out 23 muscle-ups and making short work of the wall-ball sled event, finishing in 2:57. He won both events and 3 of the last 4 events.